This is the first of 4 check-ins for the 1/3 Less Challenge. Leaving a comment on this post WILL enter you in the $50 Visa gift card giveaway. I don’t know if it’s the fact that I am done with cold and dreary weather or that there have been lots of things going on in our house lately, but my motivation in the kitchen has definitely been lacking lately. So this challenge has come at the perfect time for me. This first week, I’ve spent some time on spending 1/3 LESS time in the kitchen actively preparing meals and working to have 1/3 LESS wasted food. Both have gone very well. We’ve had some really good meals this week that did not involve much prep time at all. And our fridge isn’t overflowing with forgotten leftovers, except for one small helping of mashed potatoes. I’ll take that as a success! I’ll have a few more recipes designed to get you out of the kitchen in 1/3 Less time next week. 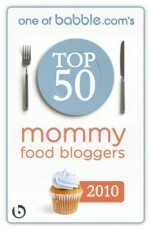 Until then though, I have three recipes from other bloggers that I need to share. These look SO good to me and they’ll definitely get you (and me!) out of the kitchen in a hurry. 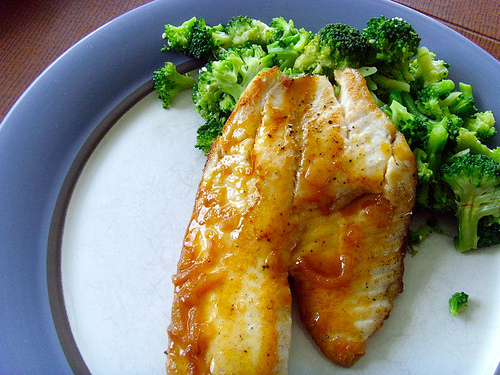 Tilapia with Honey-Tangerine Sauce. YUM!! 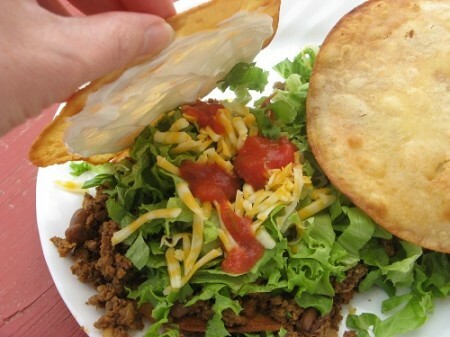 Taco Sandwich. Seriously, how good does that look? Now it’s your turn to update your progress in the 1/3 Less Challenge. Where are you going 1/3 less and how is it going for you so far? Remember, every comment on this post and on subsequent check-in reports will be eligible to win the $50 Visa gift card and Kraft product coupons. Kraft Foods is providing the prizes for this program at no cost to me. This program is not administered or sponsored by Kraft Foods or its affiliates, but solely by Cooking During Stolen Moments. Additionally, I am receiving a stipend for my time, but all thoughts and opions are, as always, my own. i too am doing my 1/3 less by preparing 1/3 less for my children and myself. this does lead to more cooking during the week but its also leading to almost 0 waste! That tilapia looks awesome. We’re working on downsizing our house in general, so I guess that’s where my 1/3 less comes in! Both of those food pictures look amazing. I have tilapia in the freezer. I will have to try it that way. I am trying to eat 1/3 less so I can lose weight! I’m trying to argue 1/3 less! 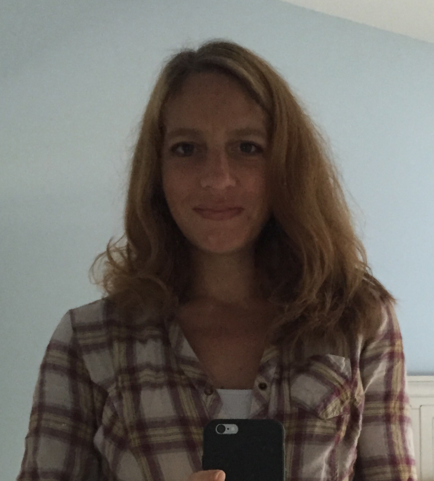 I just came across your blog and love the idea of the 1/3 less challenge. I would love to waste 1/3 less food! We are terrible about throwing away food, preparing more than can be feasibly eaten and even buying too much. I definitely need help with this! Wasting food isn’t a problem in my house–I rarely have to throw any food away. I’ve been spending less time in the kitchen since I stopped cooking primarily from recipes and instead ad lib based on what I have on hand and what I’d like to use. However, I still spend too much time shopping and planning menus. But maybe I’m not planning enough if I’m shopping too much? We are finishing up with our family observance of Passover. Having those dietary restrictions (not using products that have leavening, etc) has greatly reduced our refined carb consumption! The Tilapia recipe looks yummy, and I have some in my freezer that needs to be cooked in the next 4 weeks since we are moving to another state!! We are a military family and moving due to my husbands change of duty station so right now I am buying 1/3 (or possibly even more that that) of groceries because I want us to eat everything in our freezer. Plus we are going thru our belongings and donating what we dont need, wear or want any more. We are hoping they go to someone who can really use them!! I have been trying to use my leftovers and waste 1/3 less. I am trying so hard to waste 1/3 less food and 1/3 less gas on random trips. I am really focusing on repurposing leftovers so we hopefully will waste less. I am working on reducing gas consumption by at least 1/3. – My son goes to college where I work so we have been riding together at least 2 out of 5 days a week. Bonus: Time spent talking with him. – I walk to the grocery store and Walgreens that is close by. Bonus: Get my exercise in (and weight training carrying those groceries back home!). – Combining errands. Bonus: More time spent at home. – Driving 60 mph on the highway. Bonus: It calms me down because I am not racing around between errands. The increased gas prices have motivated me to change my life style and I’ve received blessings out of it! What a neat concept. I’m not sure what or how I’d do 1/3 less. Need to ponder upon that and then do. For the 1/3 less challenge I have started in 2 areas. First, I am actively working on using what I have in my pantry and buying 1/3 less as far as stock/pantry items go. I have lowered my food bill by about 25% so far and will continue looking for better bargains in terms of fresh produce. The farmers markets are starting in about 3 weeks and that will help a bit. the second area is in decluttering all of the paperwork that you have to save for so many years. I’m done with everything inside the house and have 3 boxes in the garage to shred and that chore is finished!! Next will be sorting through the closets for close we do not wear/don’t fit, etc. This is a great motivator challenge, especially since my husband and I are starting to look into moving, so the less we have, the less we have to move! My goal right now is 1/3 fewer processed foods on our plate. We’ve made lots of adjustments, but there’s always room for more. Dumping the canned condensed soup habit was one big step–homemade is SOOO easy. I can’t believe I paid that much for it! I just came here and the 1/3 less challenge sounds like a fun idea. I think if I implement it in my food portions then it will help me in my weight loss program as well. I”m trying to put a 1/3 less on my plate and spend 1/3 MORE on organic fruit and veg. The GC would be a help with the 1/3 more! We donated some kitchen stuff to a friend. Thanks for sharing my recipes! I’m certainly spending less time in the kitchen, but it is not totally intentional. We are moving next weekend and I have no time to cook. It has been a challenge to get healthy food in my gang while only making quick meals. I’m trying to eat 1/3 less desserts! We are going to take this challenge and spend 1/3 less time watching TV. It has gotten out of hand during the winter months! I’m definitely trying to do the 1/3 less waste thing. We’ve done a great job this week revamping leftovers. My mom is moving in with us later this summer, so now is the time to start downsizing and have 1/3 less stuff. I’m working on wrapping up some projects while the kids are still in school, then its time to take clutter and mess that overruns the house! my challenge to waste 1/3 less actually means cooking more! I alway buy fresh veggies and fruit with good intention, but then toss them when they’ve shriveled to nothin on the counter. I have bananas on their last legs that WILL be something baked by the end of tomorrow, and some asparagus that will be steamed for dinner tonight. thanks for the contest! Getting rid of clutter & clothes I haven’t worn in the past year. I am in on this 1/3 less thing. Thanks for the motivation. that taco sandwich is fun! 🙂 I’m aiming for 1/3 less STUFF–we’re purging lots lately! I am glad the post is up. I swear I kept checking Friday and I never saw it. But, I am working on 1/3 less in a few areas. I’m trying to use 1/3 less oil and butter in recipes. I’ve cut some out, and I’ve use ground flax seed to replace some, which works in some recipes, but I’m going to get more adventerous and try beans soon. Also, I’m trying to spend 1/3 less time in the kitchen too…I’m looking for more crock pot summer recipes to try out and hoping that if I plan my meals better I can plan better…cook chicken once for two meals, you know? Thanks! The taco sandwich looks delicious. I’m always looking for ways to change up the traditional taco. I am trying really hard to get rid of 1/3 (at least) of the kids stuff. This is a chore!!! My youngest child has just moved out of the house so I am truly learning to cook 1/3 less.